"If anything should happen to me, you must go to Gort. You must say these words: klaatu barada nikto." Director Robert Wise has helmed some truly timeless films (The Andromeda Strain, The Sand Pebbles, The Sound of Music, West Side Story), and in 1951 he directed the destined-to-be classic science fiction film, The Day The Earth Stood Still. Made in the tense years immediately following the atomic bombing of Hiroshima and Nagasaki, and just after the onset of the whole flying saucer craze as well, Wise's film still stands as a cautionary tale about man's inherent inability to play well with others, even if that selfishness may be a means to our own destruction. The film is based in small part on a short 42-page story from 1940 entitled Farewell to the Master by Harry Bates, and the dramatically retooled screenplay from Edmund North, complete with a number of not so vague religious overtones, explores what would happen if a spaceship landed smack dab in the middle of Washington, D.C. In The Day The Earth Stood Still, that monumental event happens just after the opening credits roll, and our military's method of greeting the ship's glittery-garbed occupant is to shoot him in the arm after he brandishes what appears to be a weapon (in actuality, a gift). The well-heeled and very human-looking alien is Klaatu (Michael Rennie), and while recuperating in a military hospital he formally requests an audience with the leaders of every country on Earth in order to deliver a message of the utmost importance. When he is informed that such a meeting is impossible, due to various political tensions between countries, Klaatu sneaks out of the hospital, and after adopting the name Carpenter (one of the few Klaatu-as-Christ parallels), takes up residence at a local boarding house to see first-hand how Earth people really are. As the government and military scurry to locate the missing Klaatu, our alien friend goes about winning over the attention of the lovely Helen Benson (Patricia Neal), her young son Bobby (Billy Gray), and a frizzy-haired Einstein-like professor (Sam Jaffe). 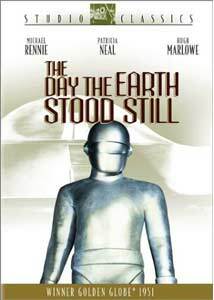 The Day The Earth Stood Still is really a science-fiction film about what could happen, rather than what does happen. Unlike todays batch of genre films, there are no grandiose battle sequences full of exploding national landmarks, though Klaatu's faithful lumbering robot guardian Gort (Lock Martin) does manage to melt a few bits of military hardware with his heat-ray vision. Even the titular event is nothing more than a thirty-minute warning from Klaatu, one intended to make the people of Earth sit up and take notice. It is the underlying threat of what might occur that is the message here. And it's a good one, at that. The laughable aspects of this 1951 film, like the lone pair of easily overpowered soldiers left to guard Klaatu's spacecraft or the overcranked footage of a fleeing crowd (which made the scene look like it was lifted from a Three Stooges short) are still there, as is the highly visible wire rig that supported Patricia Neal as she was "carried off" by Gort. These issues, prevalent as they are, are completely negated by the classic theremin-driven score by the great Bernard Herrmann; the score is, like most of Herrmann's work, a living, breathing dynamic layer in the enjoyment of a film like this, and while he is largely known for his Hitchcock compositions, his work on Wise's film is one of his best. Michael Rennie, despite his British-tinged accent, made for a properly smug and politely all-knowing alien, thanks to his angular features and tall, thin frame. At times it seems that Rennie's Klaatu is a celluloid predecessor of sorts for another rail-thin British alien, David Bowie's Thomas Newton in The Man Who Fell To Earth—who knows, maybe they came from the same star system. It is incredibly hard to imagine how The Day The Earth Stood Still would have played had studio head Darryl Zanuck succeeded in casting Spencer Tracy in the role, as he originally intended; thankfully producer Julian Blaustein and director Robert Wise were able to convice Zanuck otherwise. Though Rennie came to be strongly identified with Klaatu over the course of his career (even immortalized in a song from The Rocky Horror Picture Show), in 1951 he was relatively unknown to American film audiences, and as such his performance here likely had far more validity and impact on filmgoers of the time than a highly recognizable face like Tracy might have achieved. This is one of the 1950s' finest science-fiction films, albeit a kindler, gentler and certainly more intelligent one. Image Transfer Review: Presented in the original 1.33:1 full-screen aspect ratio, The Day The Earth Stood Still has never ever looked better. The restoration work done is nothing short of incredible, all the more noticeable in the comparison section on this disc's extras (see below). This transfer is so clean that some of the effects shots (like the so-called hidden wires supporting Patricia Neal as she is lugged off by Gort) literally leap off the screen. Scratches, sprocket holes, nicks and any other print flaws have been obliterated, leaving a beautifully sharp black-and-white transfer. Audio Transfer Review: This THX-optimized disc from Fox features the film's original mono track, as well as a new stereo version. The chilling Bernard Herrmann score is the only element that sounds slightly inflated in the stereo mix, while dialogue retains the limitations of the original mono track. The enhanced stereo mix is only a moderate improvement over the hiss-free mono option, and traditionalists will likely chose to listen to the film as it was originally presented. French and Spanish mono tracks are also provided. Extras Review: Fox has released The Day The Earth Stood Still under their Studio Classics banner, and have included a treasure trove of goodies on this two-sided disc. Leading the way is a full-length, scene-specific commentary from director Robert Wise, anchored by Nicholas Meyer (director of Star Trek II: The Wrath of Khan and The Day After). Fans of the film will find this track immensely informative, as Meyer prompts Wise with a batch of literate and intelligent questions about the director's style and approach. Wise's recollections on this over 50-year-old film seem as fresh as if it was made yesterday, and he is able to supply a real wealth of background info on the production and the impact it had on audiences. It was also interesting to hear an old-school pro like Wise's surprising take on the impact of surround sound and unnecessarily clever camera angles, too. Great track all the way around. Also on side one is a 1951 MovieTone News Reel (06m:52s) that has tidbits on the U.S./Japan mutual defense pact, General MacArthur, the Mrs. America pageant and The Day The Earth Stood Still receiving a nerdy science-fiction award. Side one then concludes with a theatrical trailer and a THX Optimizer. After flipping the disc over, fans will find a perfect addendum to the commentary as Fox has included the 1995 Making The Day The Earth Stood Still documentary (01h:20m:35s). This segment covers everything from script origins from the Harry Bates short story to casting (Klaatu was almost played by Spencer Tracy) to Bernard Herrmann's score to test audience reactions, and features detailed reminiscences from producer Julian Blaustein, director Robert Wise, cast members Patricia Neal and Billy Gray. There are a lot of great Darryl Zanuck stories from both Blaustein and Wise, and Neal admits to having had trouble keeping a straight face while uttering her now classic lines to Gort. Much like the commentary, this is an in-depth look at the creation of the feature, and not the typical lightweight drivel that passes for "making of" material these days. In addition to input from memorabilia collectors Bob Burns and Stephen Smith, director Joe Dante (The Howling, Gremlins) offers his fan perspective on the film's impact. Excellent stuff! Side two also houses Restoration Comparisons (03m:56s), and features nine scenes presented side-by-side to show the eye-popping dramatic improvements made in restoring this film. After having been restored for the laser disc release, a new 35mm print was created, and from that, two fine grain masters were created: one for this transfer and the other for the Fox archives. Comparisons are shown between the 1995 film transfer master and the 1993 laser disc master, as well as the 2002 film restoration versus the 2002 film restoration with video restoration. As this segment shows, the work done is simply stunning. The Stills Galleries are broken into six sections (Production, Scene and Set Photos, Shooting Script, Construction Blue Prints For The Ship, American and British Pressbooks, and Poster, Lobby Cards, Spaceship Model and Gort) and feature an array of well over 350 images. The inclusion of the full Shooting Script segment is easily the gem of this section. Side two wraps with two trailers, for One Million Years, BC and Journey To The Center Of The Earth. The disc is cut into 15 chapters, and includes subtitles in English and Spanish. The Day The Earth Stood Still, for all of its dated effects, is just as historically relevant today as it was in 1951. A great story, a strong message and the immortal "klaatu barada nikto" line of dialogue. What more do you need? This is a genuine classic, and Fox has treated it so with this impressive release. Highly recommended.